Early summer means lots of fresh peas. I've posted about sugar snap peas this year, and wanted to get in one more recipe before we move on from this vibrant fresh staple. 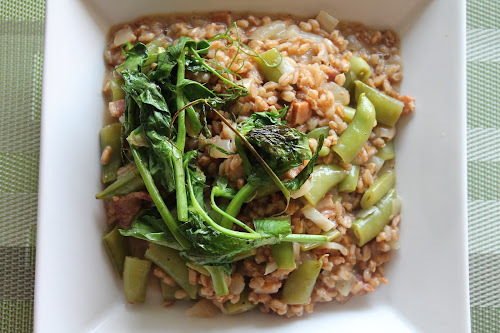 This farro risotto recipe plays on concepts from two previous recipes: the Farro Risotto with Pancetta and Kale and the Peas 3-Ways Risotto, melding what I like best about those two dishes into one delicious whole. Chewy farro, a wheat grain, is a good substitute for arborio rice in a risotto. I buy it semi-pearled, so it cooks faster than other wheat grains. It's chewy texture and earthy flavor goes nicely with hickory-smoked bacon and provides a contrast to the fresh pea flavor of this dish, which is delivered three ways: pea-flavored broth, sugar snap peas and a topping of sautéed pea tendrils. Before those peas are gone from the markets, this is one great dish for singing their praises. 1. Bring chicken broth and water to a low simmer. And peas and simmer while you prep the other ingredients and start the risotto. 2. Heat a Dutch oven or large sauté pan over medium heat. Add bacon and cook until crisped and brown. Remove bacon with a slotted spoon and set aside. Remove excess rendered fat to leave about 1 tbsp. in the pot. 3. Add 1 tbsp. unsalted butter to pot. When melted, add onion and sauté until softened, about 5-8 minutes. 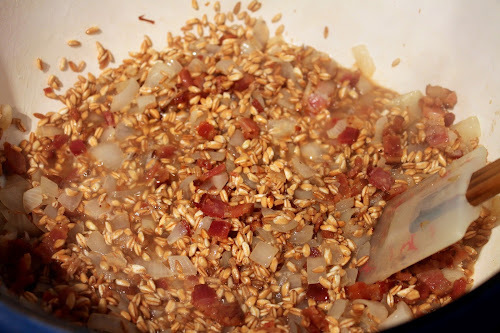 Add the farro and cook, stirring occasionally to toast, about 5 minutes. 4. Add cooked bacon back to the pot, then add the white wine. Stir frequently as the wine cooks down until the point when a spoon swiped across the bottom of the pot leaves bare pot that isn't immediately covered with liquid. 5. Strain out the peas from the chicken broth and discard them. Start adding the warm broth by the ladle to the farro, stirring to incorporate and cooking until each added ladle of liquid is incorporated so that the bottom of the pot can be seen when a spoon is swiped across it. After about half of the broth has been incorporated, stir in the sugar snap peas. Continue adding broth until the grain is tender but still chewy (you may not need all the broth). Season with salt and freshly ground black pepper, to taste. Remove from heat and stir in the grated parmesan cheese. 6. While the risotto cooks, heat olive oil in a medium frying pan over medium heat. Add pea shoots, season with salt and cook until wilted and lightly browned, about 5 minutes. Set aside. 7. Serve the risotto in shallow bowls topped with a few of the sautéed pea shoots.